Welcome to Rethinking National Security’s full 2016 Presidential Election Coverage. Now that we have our two main party candidates in Donald Trump and Hillary Clinton, we have decided to move beyond our primary coverage page, using this page for our dedicated coverage of the general election campaign. Please see the individual candidate pages for their takes on the issues and below for polling updates. Nate Silver at FiveThirtyEight gives Hillary Clinton a 71.4 percent chance of becoming the next President in his polls-plus forecast as of November 3, 2016. Silver targets Arizona, Colorado, Florida, Iowa, North Carolina, New Hampshire, Nevada, Ohio, Virginia, and Wisconsin as potential swing states this fall. RealClearPolitics’ average of polls gives Clinton a 3.2 percent lead in its average of polls in a two-person race. In a race that includes Libertarian Candidate Gary Johnson and Green Party Candidate Jill Stein, RCP projects Clinton with a 3.3 percent lead. 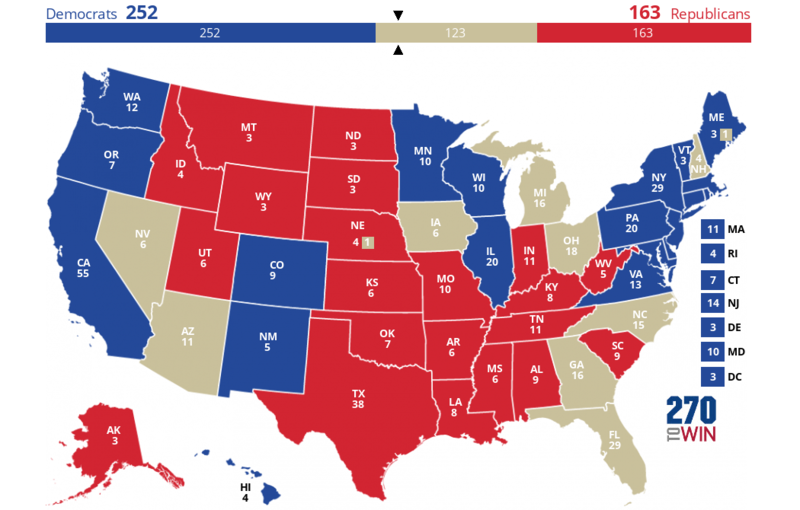 270toWin projects Clinton as having a 252-163 electoral vote advantage, with Arizona, Florida, Georgia, Indiana, Iowa, Michigan, Nevada, New Hampshire, North Carolina, Ohio, Pennsylvania, and Wisconsin characterized as “toss-ups.” Electoral map displayed below. The Wall Street Journal has provided a summary of the candidate’s positions on a variety of national security issues. We have posted the link here.